This is a visually challenged map. It plays pretty good with about 8 or so, but you might need to adjust some bot settings. Your basic means of destruction comes in the form of flak cannons, with some help eventually coming from bio globs. You spawn in cutouts on a mountain top, wind your way to the top, destroy a force field that surrounds an elevator, and hope you don't destroy yourself in the process. Descend via the elevator, take the spiral staircase down to destroy 6 doors, all the while battling foes. 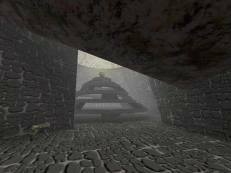 Once the doors are destroyed, another force field is removed and you can continue your descent inside the mountain via more winding stairs. Eventually you reach some caves, descend even further, and capture the grail for the win. It's easier to defend than to attack when playing with bots, so that's why I mention the adjustment. You only have one route to take initially, until you reach the caves, and this seems to work okay. The white grout, stone textures combined with the lighting did nothing to help the looks of the place. It's a simple map, but assault maps are few and far between, so if you're an assault nut you might want to give it a try. For the author: The outside elevator looks rather nice; it would have been great if you could have extended visuals like this throughout the entire map. The stone textures just don't work well, unless you take the time to painstakingly align everything and light things properly. Good lighting would have made a big difference in the looks of the map, so maybe practice on that some more. I give it a four, just cus I have played much worse AS maps with the same score. Looks like hell, fun to spam bots. As promised in the author's readme file: the bots fall off of the mountain and don't die. Basically all Assualt maps are terribly underrated. No it doesn't get a ten. It's just........missing something. I'm sorry, but this map...I don't even have the words for it..
to small for 16 players !! !